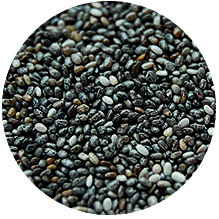 Chia is a natural product with a neutral taste and natural odor. When its roasted, it has a slight nutty taste. However, when the seeds are mixed with other ingredients they have a completely neutral taste. Chia combines many different healthy nutrients in a single food and is a perfect addition to daily nutrition. High levels of healthy, polyunsaturated omega 3, fatty acid. Contains high levels of fibre. Contains high levels of minerals such as calcium and magnesium. In 2009 chia seeds were licensed as a new food additive in Europe under the Directive concerning Novel Foods. The seeds are easy to use as an ingredient because they have a neutral taste. If you use Chia in your baking you will simply be giving your bread an additional nutrient boost. As an addition to your breakfast cereals.